It is a great pleasure to join you at the opening of the Bank of China Private Banking Service Centre in London. May I first of all express my warmest congratulations! Ten days ago, I came back from Beijing after attending the 19th National Congress of the Communist Party of China. This epoch-making congress has a profound and far-reaching impact on the CPC, on the country and on the future development of the Chinese nation. 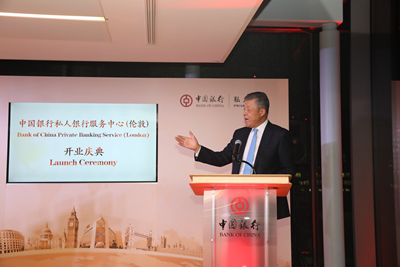 Also ten days ago, the Bank of China London Branch marked its 88th anniversary. As you may know, to the Chinese people, "eight" is a lucky number. So, I hope 88 will double the good luck for the Bank of China London Branch. Over the past 88 years, the Bank of China London Branch has borne witness to the enormous changes in both China and Britain. It has seen the historic progress of China-UK relations. And it has been growing alongside the booming China-UK financial cooperation. Today, the Bank of China is taking a new step forward with this opening of the Private Banking Service Centre in London. I think this has three fold significance. First, it is a new evidence of China's strong commitment to reform and opening-up. Staying open to the world is the only way to prosperity and development. The 19th Party Congress makes it explicitly clear that "China will not close its door to the world; we will only become more and more open." Will China continue to open up in the new era of socialism with Chinese characteristics? How will China advance its opening-up efforts? What is the best way to achieve opening-up? The answer is, China will open up in all fronts. This means wider areas and greater depth. This also means more innovation, better planning and higher quality. The Bank of China has clearly seized the new momentum in China-UK relations. It is working exactly to meet the new demand in our bilateral cooperation. The opening of the Private Banking Service Centre here in London is the best illustration of China's efforts to advance opening-up in all fronts. 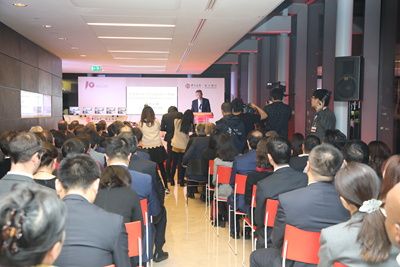 Second, today's event showcases a new progress in China-UK financial cooperation. London is a world financial centre. Financial cooperation has always been an indispensable part of the overall business ties between China and the UK. Over the past years, we have had extensive and diversified cooperation in the fields of banking, asset management, insurance, fin-tech, etc. The outcomes have been fruitful. Last year, China's Ministry of Finance issued in London three billion RMB sovereign bond. This was the first of its kind ever issued outside China. Also in London, the first Green Covered Bond of the Bank of China was successfully listed. The response from investors across the UK and the world was overwhelming. Looking ahead, China-UK financial cooperation is going deeper, more diversified and customized. By opening the Private Banking Service Centre, the Bank of China has caught the latest trend and will give new impetus to China-UK financial cooperation. Third, today's event also demonstrates a new momentum in the booming international business of Bank of China. The Bank of China London Branch has a significant place in China's financial history and China's financial cooperation with the world. It is the first overseas branch ever set up by a modern Chinese bank. This marks the very first step of China's financial sector expanding its operation internationally. In recent years, the Bank of China UK has benefited from London's prowess as a global financial centre. It has worked constantly to improve its international operation. It has provided quality services to Chinese and British companies here in the UK. It has made active contribution to China-UK business cooperation. 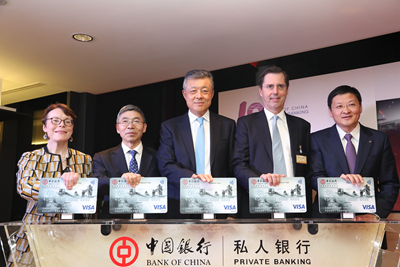 The opening of the first Private Banking Service Centre outside Asia by Bank of China represents a major step forward in the international development of Bank of China. It is also a new highlight in China-UK financial cooperation. "A mountain stands tall for it sits on solid rocks. A river runs long for it never stops taking in brooks and streams." The China-UK "Golden Era" calls for the unremitting efforts of people from all walks of life from both our two countries. We must keep moving forward step by step. We must keep making progress bit by bit. In this new era, I hope the Bank of China London Branch will live up to its new mission and achieve new success. I hope you will make new and greater contribution to China-UK "Golden Era". 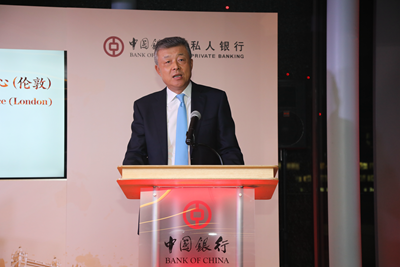 On the evening of November 14, Ambassador Liu Xiaoming was invited to attend the opening ceremony of Bank of China Private Banking Service Centre (London), and delivered the above speech. Charles Roxburgh, Second Permanent Secretary to the HM Treasury, Catherine McGuinness, Chairman of the Policy and Resources Committee of the City of London Corporation, and Zhang Qingsong, Vice President of the Bank of China also spoke at the event and joined the Ambassador in pressing the opening button. More than 200 guests, including Chinese-funded enterprises in the UK, British enterprises and representatives of local overseas Chinese, attended the ceremony. The Bank of China Private Banking Service Centre (London) is the first of its kind set up by the Bank of China outside Asia. It is a new initiative for the Bank to build a premium brand for private banking and improve its overseas layout of private banking businesses.